As Kimberly (at The Broke and the Bookish) put it....as painful as book to movie adaptations can be, the changes they make, the things they leave out... there are some great ones out there, even if they aren't as good as the book (they pretty much never are) they are enjoyable. 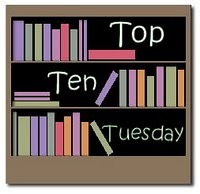 So, in no particular order, my Top Ten Book to Movie Adaptations. 1. Where the Wild Things Are: I just absolutely loved this movie. I thought it was so cute and I love the soundtrack. My kids however, didn't really care about it. 2. Romana and Beezus: I think this movie is so different than the book(s), but it was another one of those "so cute movies." I really liked all the stars in the movie and thought they did a fantastic job with each character. 3. The Blind Side: I am not sure what came first....the book or the movie. Either way, the movie is FABULOUS and something that I wish I could do some day. This is a 10 star(fish) movie for me. 4. Twilight Series: I actually like the movies better than the book. I thought they did a pretty job keeping the movie true to the book. Disclaimer: I listened to the books on my ipod, I might have not been paying attention through the whole book! 5. The Princess Diaries: I love this entire series and wish they would do more of the books into movies. I was not thrilled with Julia Andrews as the grandmother - I think Cloris Leachman or Betty White would be a better grandmother. 6. Diary of a Whimpy Kid: This is another movie that I think they did such a great job keeping it real with the book for most of it. I loved the casting for this movie too. 7. The Grinch: Who doesn't think Jim Carey is the perfect Grinch? 8. Message in a Bottle: I loved the movie more than the book, but I loved Notebook, the book, better than movie! 9. The Girl With A Dragoon Tattoo series: I liked all three movies. Even though they didn't follow the book in the same order....they covered everything, just in a different order. 10. Suzanne's Diary for Nicholas: This was a tv movie....so I am not sure if it counts. Nothing will ever be as good as the book, but it was still as good movie (for tv)! I still need to watch The Girl With THe Dragon Tattoo! I really liked the book so I'm excited to see what the movie is like.